Coach Slava Koulikov has called on the people of Peterborough to back Phantoms’ bid for glory. The city team entertain Telford Tigers tonight in the first leg of an English Premier League Cup semi-final (January 18, 7.45pm). 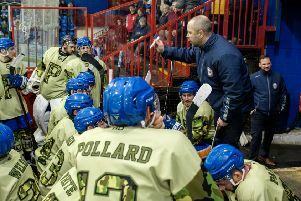 And Koulikov wants to see Planet Ice packed as his men attempt to reach the final for the second successive season. He said: “I think I’m right in saying we can get over a thousand people into our building and it would be brilliant to see it full. “Our fans make great noise and always give the guys their backing. “It is a tight rink with a pretty small ice pad and not the sort of place that other teams enjoy playing at. “We have to use that to our advantage and try to get the win we need to put ourselves in a strong position in the tie. “We know what it takes to reach the final of this competition after doing it last season. Phantoms beat fierce rivals Milton Keynes at the semi-final stage last season before losing to Guildford in the showpiece after being thumped in the first leg. This time around they could meet MK in the final. Lightning host Hull tonight in the second leg of the other semi, having already bagged an away win in the first leg last week. But Phantoms’ focus will solely be on taking care of business against table-topping Telford. They have already registered three home wins against the Tigers this season - two in regulation time and one after overtime and penalties. “We have a good record at home against Telford this season and hopefully that can continue,” added Koulikov. “We have been playing well and picking up results for the last couple of months despite having a lot of guys out injured. A late decision will be made over the participation of defencemen Ben Russell and Scott Robson tonight. They have missed the club’s last four and two games respectively due to concussion. Forward Will Weldon returned from a seven game lay-off with a knee problem when Phantoms won 7-0 at crisis club Manchester on Sunday to complete a four-point weekend, featuring back-to-back shut-outs, on the road. They had triumphed 2-0 in Swindon the previous night.